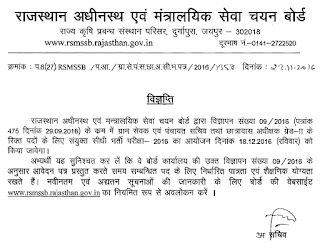 Rajasthan Subordinate and Ministerial Services Selection Board (RSMSSB) will organize a written test for the posts of Gram Sevak & Panchayat Sachiv and Hostel Warden on 18.12.2016. There are a total of 3948 posts that are to be filled and the last date of application submission was 31 Oct 2016. Now the written test is to be held as a part of this recruitment's selection process. So RSMSSB Gram Sevak Exam Admit card are going to be released by the board around 7-10 days prior to exam date. The link to download them is provided below. The written exam for Gram Sevak and Panchayat Sachiv and Hostel Warden (Chhatrawas Adhikshak Grade II) posts is scheduled on 18 December 2016. For that, admit card are going to be available online approx. 7-10 days earlier. You can download RSMSSB Gram Sevak & Panchayat Sachiv admit cards from here via the official website rsmssb.rajasthan.gov.in. Here is the link where the admit card link will be posted after the release. The written examination are to have objective type questions carrying equal marks for each question. There will also be negative marking for wrong answers. Cut off marks will be 40% for qualifying the exam. Those who got less then these marks will not be shortlisted for further process. In order to download the admit card for RSMSSB Gram Sevak exam, visit above link and enter the application no., date of birth and text given. Their RSMSSB Gram Sevak Admit card 2016 will be up on display and its printout is to be taken and brought at the test centre on the date of examination.